Nix the Father’s Day shirt and tie and get Dad something he can really use: a better golf game. How about a pair of comprehensive instructional golf books which will clearly illustrate the best way to achieve improved scores and lower handicaps? And also, why not plan on spending the afternoon with Dad while watching the traditional Father’s Day final round of the 2013 U.S. Open at the storied Merion Golf Club? 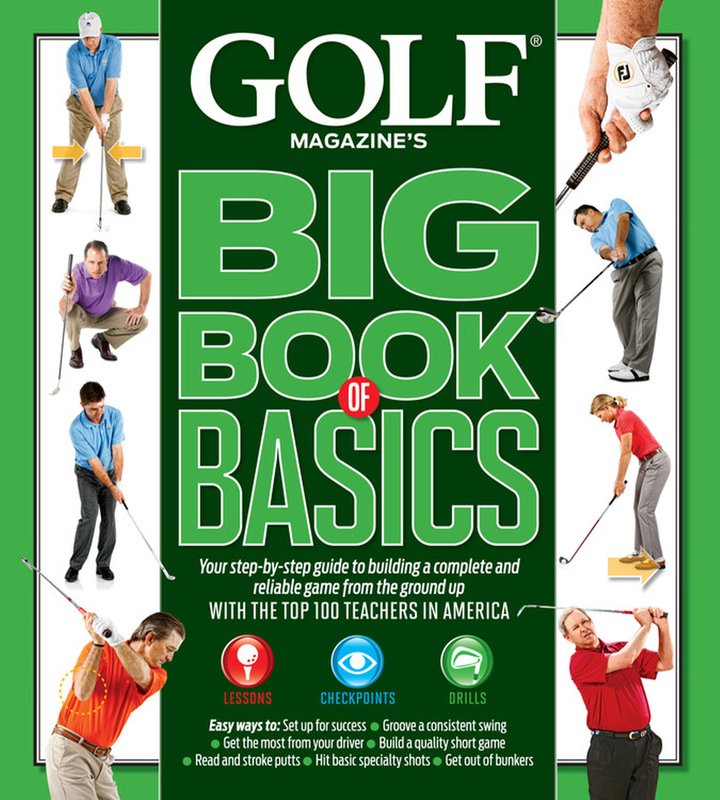 GOLF Magazine recently introduced the BIG BOOK OF BASICS: Your Step-by-Step Guide to Building a Complete and Reliable Game from the Ground Up and THE PAR PLAN: A Revolutionary System to Shoot Your Best Score in 30 Days. And truly, if Dad follows these plans, his game will improve and you will then be the favored child in your family. Both books are edited by GOLF Magazine Instruction Editor David DeNunzio and offer clear and concise concepts on everything from fundamentals to course management. More importantly, numerous pictures and illustrations capture the essence of what would be complicated or impossible to describe in mere prose. Golfers generally learn more by seeing than they do by preaching, hearing, or reading, especially if one is a visual learner. THE BIG BOOK OF BASICS is an especially timely gift considering the U.S. Open’s arrival at Merion, in Ardmore, Pennsylvania. Two of the seven instructors are long-time Philadelphia area professionals and members of GOLF Magazine’s prestigious Top 100 Teachers club – Lou Guzzi, from Talamore CC in Ambler, PA and Dom DiJulia, from Jericho National GC in New Hope, PA. Guzzi, a two-time Philadelphia Section Teacher of the Year begins the book by discussing the pre-swing basics of grip, address and aim. Given that the U.S. Open crown goes to the player who can hit fairways, which at Merion will be 22-24 yards wide on this 111-acre, almost-7000 yard historical layout with deep rough penalizing even minor offline shots, Guzzi’s aiming tips will be invaluable. DiJulia, a PGA Master Professional and also a two-time Philadelphia Section Teacher of the Year, provides the putting instruction by taking a big-picture approach and suggests focusing on the process of planning your putt by mastering six basic steps rather than obsessing about too many technical details. When Merion was built in 1911, members had only to learn the difficult undulations and angles of the small greens because speeds were much lower then. Now, those contours remain but the greens surfaces will be revved up and firm, and with those pesky USGA pins in places that even the members are likely unfamiliar, DiJulia’s putting mantras would be beneficial….even if you are not competing in an Open Championship. Other instructors are also members of GOLF’s Top-100 Teachers Club: 30-year teaching veteran Mike Perpich of RiverPines GC in Johns Creek, GA teaches how to build a repeatable swing by blending correct body and arm movements. Brian Manzella of English Turn G&CC in New Orleans shows golfers how to squeeze those extra yards out of their drivers, fairway metals, and hybrids. Baltusrol GC’s Jason Carbone in Springfield , N.J. , one of the best young teachers in the game, provides a short-game clinic illustrating how to master the three basic shots from inside 50 yards: the chip, pitch and lob. With the basics now in your arsenal, Kellie Stenzel of Palm Beach Country Club, FL, one of the top 50 women teachers in the country, offers techniques that have almost been lost due to technological advances in today’s equipment: how to shape shots by making simple adjustments. She then tackles the Top-10 most common swing faults and how to fix them. Mike Davis of the Walters Golf Academy in Las Vegas , a 16-time PGA Teacher of the Year in the Pacific Northwest and Southwest Sections – and not the Mike Davis from the USGA – wraps things up with a primer on escaping the sand as easily as possible….certainly a needed technique at the U.S. Open with Merion’s deep and plentiful bunkers, 100 in all, especially the ball-eating one at the tournament’s shortest hole ever, the 115-yard 16th. Watch the pros’ techniques as this cavernous bunker will surely eat up tentative passes at a front pin. If Dad is new to golf (or you are and plan on borrowing ‘his’ book) or you’ve played for years but never truly conquered the basic fundamentals of the game, this book is for you. Conquer those basics and you can always find your way. The best teachers help you to know your own game, analyze when something goes wrong, and then fix it. According to DeNunzio, “Many of our previous titles covered advanced moves and techniques, but the BIG BOOK OF BASICS addresses the proven basics every player needs to shoot lower scores. This book is the ultimate golf primer. It doesn’t matter if you’re new to the game, frustrated with your ability to score or simply in the market for a refresher on tried-and-true mechanics. No more surprises. No more blow ups. Our basics team has left nothing to chance in providing the direction players of all skill levels have been seeking to elevate their games.” Combined, this book encompasses over 2,000 years of teaching experience by golf professionals who have instructed more than one million golfers. Some of the attractive features of the BIG BOOK OF BASICS are the hundreds of color photos and easy-to-follow lessons and drills which illustrate each concept. Fundamentals are non-negotiable for lifelong learning and the level and quality of instructional lessons here make them relatively easy to master. 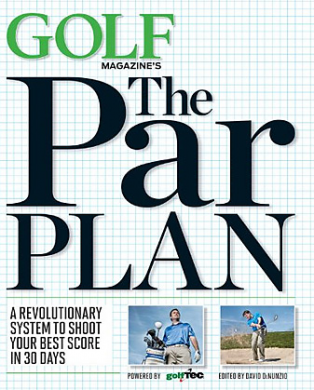 GOLF Magazine’s THE PAR PLAN, a companion to THE BIG BOOK of BASICS. THE PAR PLAN really should be a companion book to the BIG BOOK OF BASICS. Here’s why: it is well known that the longest walk is from the practice tee to the first tee. Armed with the skills gained from the BIG BOOK, Dad can now learn what to do with his newly-attained knowledge. 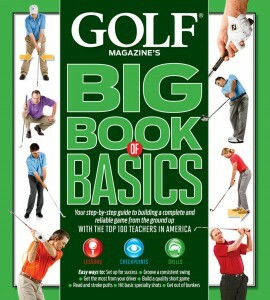 This tome offers instruction on three levels: illustrated lessons, video, and swing-analysis apps from your phone. Three top GolfTEC instructors with thousands of hours of teaching experience round out the editorial staff: PGA Master Professional and 2008 Colorado Section PGA Horton Smith Award winner Andy Hilts, Houston GolfTEC Regional Manager Doug Strawbridge, and PGA Certified Professional and GolfTEC Manager of Teaching Quality Patrick Nuber. When playing by yourself or with friends, you often cannot pick up subtle swing faults or missteps. Little problems become bigger ones and all of a sudden, you’ve got trouble. THE PAR PLAN offers a solid method to get on track and stay there: you’ll get lesson schedules and targeted at-home and on-range skills; there are self-assessment tests as well as the revolutionary My Pro To Go app you can load onto your Smartphone. Also offered within the nine key areas of instruction – you’ve got to love the ‘How to Scramble’ chapter – are dozens of statistics, which do help you feel better about your own game. For example, did you know that PGA tour pros, on average, only get the ball to within 8’9″ when they miss a green? Or that they make only 29.8% of their putts from 10-15 feet? Also included are tips, secrets to scoring, action plans, and much more. Especially interesting and beneficial is the My Pro To Go app for your Smartphone or tablet. You’ll need a friend to take initial videos of your swing from the front and side. Once you’ve got those, you can begin to analyze your own swing with help from the book’s instructions. If you have ever studied the pros on the practice range, you’ll have seen that video dominates Tour practice tees – and now you can take advantage of the technology. THE PAR PLAN even has lessons on how to ‘Fuel a Successful Round’, with suggestions on energy products, health bars, and supplements – an important facet of the game for serious golfers who understand that nutrition and fitness play a huge role in performance. Adding GOlfTEC, the world’s largest and most experienced golf improvement group, as a partner makes sense: GolfTEC now teaches 25% of all private golf lessons, delivering a 95% success rate; their instructors have taught 250,000 golfers over 3.5 million lessons; each coach annually assists at least 25 students in shooting their ‘career’-low round; and accessibility is widespread with 500+ coaches at 160 centers across the U.S. and Canada. Considering the cost of both books combined is under $63 (plus shipping), $32.95 for THE BIG BOOK and $29.95 for THE PAR PLAN, this gift is only slightly more expensive than a dozen Titleist ProV1’s, a good golf shirt, and certainly new shoes or a new putter. To find out more or to order, go to www.golf.com/bigbookofbasics, www.golf.com/parplan.